Grand Theft Auto strikes again! 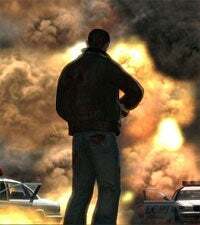 A 13-year-old boy who shouldn't have been playing the game in the first place claimed that he doused three cars in Lyons, France with petrol and set them on fire after playing a few hours of "GTA IV: Liberty City" on his PC. The Mail Online does a stellar job of reporting the incident, not only getting the game wrong (GTA IV isn't released on PCs yet and doesn't have a subtitle), but the details as well. The game awards points (for) creating as much as crime and destruction as possible in a city.